I am removing a 496 and replacing with a 696. Does anyone know if that is a direct swap? I will change the mounting panel and move the carb heat and cabin heat controls but what about the GPS wiring? Is it identical or will it require some changes. And what about the the Dynon set up and auto pilot. Trying to get any needed parts and information so it is easily done at one time and I don't need to wait for parts or information to complete the job. I am interested in this same swap as well. This is part of my ADSB upgrade plan along with the GDL-82 and GDL-39. Is this your plan Al? So nobody on the site has done this upgrade??? In talking to FD USA it sounded like many have already... maybe they are not active forum members. Looks like it time to give Garmin a call. I will post what I find out. Thanks Tom that is helpful! Anyone else? Pictures of the final panel layout? There are a couple pictures in the "Ifly 740b install" thread. Talked to Garmin this morning.To wire it up you will need a Bare Wire Kit part # 010-11206-15. Available at Aircraft Spruce or Sportys. $27.00. You may have one that came with the unit. You will also need the MRA from Flight Design and factory relocation bezel for the Carb and Cabin heat controls. Also from Flight Design. A replacement panel mount and the bracket for mounting the 696. Scan of MRA attached. My avionics person on my field (Sonoran Avionics) has done many of these panel upgrades and swaps with the Garmin and Dynon. You can replace any of the Garmin 296,396 or 496 with a 696 or 796. You do get a new panel. Garmin told me a wiring harness was needed. Does you guy disagree? You may need to alter the wire hookups, yes. Either buy a harness, alter an existing one, or make a new one. 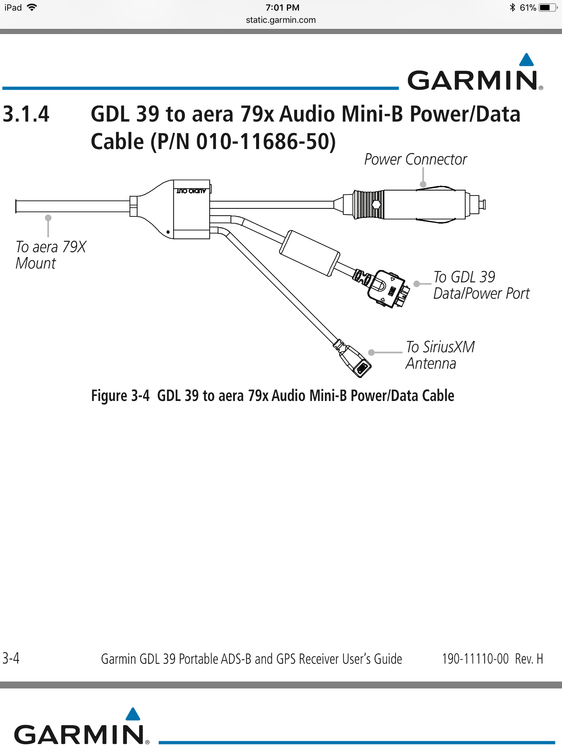 The Garmin user guides actually have technical installation sections with pinouts that you can verify. Ordered a bare wire kit from Spruce. Garmin says it will have all I need. I am looking to wire a new 796 and GDL 39 utilizing the harness below makes this a fairly plug and play setup however, I need to find the GPS out signal in this harness. I believe it is in the leg to the GDL39 but I don’t want to assume. Short of calling garmin I haven’t been able to find a clear answer. Anyone know? Thanks for the link but in the wiring harness that I am using (not bare wire) which leg would the orange wire be in, the main wire bundle or the branch to the gdl 39? The GDL 39 manual (page 3-5) shows the bare wire to just the GDL 39 has the orange wire as part of its bundle. I ASSUME it would also be the same with the wire harness you show above. Sorry but that is the best information I could find. Yes thanks! I spoke with Garmin and they were able to point me in the right direction. (Its the green wire in the GDL39 leg). It will certainly make the installation much easier.